Princess cut diamond half eternity ring, set with 0.33cts of princess cut diamonds along a channel set 2.5mm ring. This graceful design features perfectly matched Princess cut Diamonds within a channel setting. 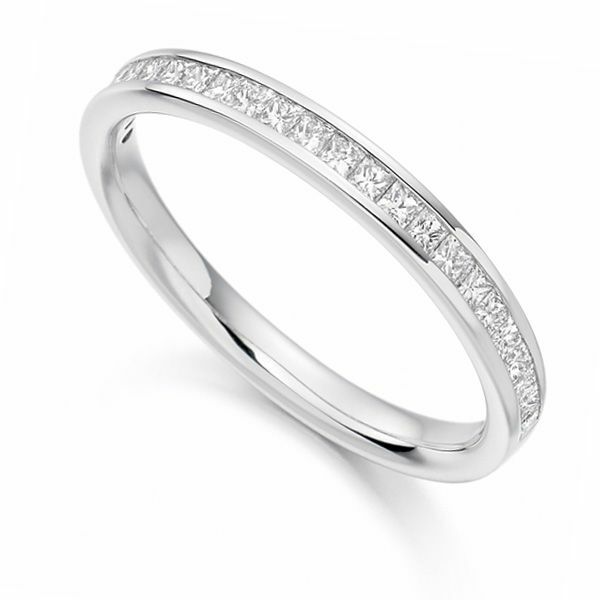 A classically stylish design for an Eternity Ring. With a total Diamond weight of 0.33cts, and each Diamond achieving F Colour and VS1 Clarity, this is a truly luxurious ring. The ring itself measures 2.55mm, and is a traditional court profile band, combining style with comfort. We can craft your ring for you in a number of different precious metals, including 18ct Yellow Gold, 18ct White Gold, 18ct Rose Gold, Palladium or Platinum. Please allow us approximately 3 weeks to craft your ring for you, and it will be delivered straight to your door, presented in our luxury Serendipity Diamonds packaging. Service rating : Brilliant service, ring was ready in the time specified and easily contactable by phone if you have a query. Product : Love the ring.It looks exactly as it does on the website and goes brilliantly with my princess cut diamond engagement ring which was purchased from you 10 years ago.